Cross compiling swt and gtk: CVS head or not? Finally. After too many hours on such a ‘simple’ thing, I’ve managed to get swt up and running on a (rather) small device (with a PPC) with gtk as backend. What did I do wrong? For some reason I didn’t get the Freetype support into pango. the pre processor passed on to the #endif statement and, yup, crap will be returned when executing. When the function returned 0xd (13 in decimal) I was quite sure something was wrong. OK, I was just about to write a bug report to pango when quickly checking the latest version of the function. It’s now fixed. The function returns 0 after the last #endif .Perfect. Should one go for CVS head or the latest stable release??? Yup, I’ve very soon read all the Gaston comics. Read them some twenty (uh oh!) years ago and decided to buy the collection some months ago. It truly inspired me (I am being honest!). I still have some Lucky Luke to read though. Since I read the Asterix and Obelix albums last year I am beginning to run out of childhood heroes. Of course there’s Spirou. Hmm, is there a collection out there? A box (in Swedish), anyone? And yes, of course. 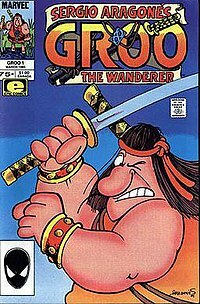 Groo. I’ve saved the Groo albums. At least the first four years or so. and btw, Sweden has some great comic writers……. more on that some other day! I’ve been using workrave a lot lately since I’ve been sitting rather much in front of the computer and am a bit afraid of hurting my body. Workrave works quite well, but when I am too focused (yes, I know how to focus!) I start cheating. So how to make it harder for me (and you) to cheat? Grab (yup, an active grab for those into X11) the mouse and perhaps even the keyboard. How about grabbing the mouse and if you try to move it, then warp the pointer to somewhere else. And if the mouse warped too much (meaning you tried to work even tough you should have taken a break) then turn on some kind of annoying mouse distorted movement…. … got a text message from Peter that there was an article about Xnee in Linux Magazine. Always nice for an ego as big as mine. But I really wished the author had not focused on gnee…. But since he did, it is a sign that gnee needs moe attention. .. we’ve just launched the web site for the conference 7-8 of December in Gothenburg. The conference’s name is FSCONS. Since the conference is about Free Software I really think you should go to the web site and check it out. Diction identifies wordy and commonly misused phrases. Style analyses surface characteristics of a document. simulate particles on 3D tetrahedra meshes. drivers for various file formats and printers. references, citations, and the index in LaTeX. A small-scale painting program for GNOME.